October 3, 2017 - Rock star Tom Petty has died, his manager Tony Dimitriades announced Monday. He was found in critical condition at his home in Malibu, Calif., Sunday night after suffering full cardiac arrest, as first reported by the website TMZ. Petty was taken to UCLA Santa Monica Hospital, where he died on Monday at 11:40 p.m. ET. Petty was a widely lauded songwriter, singer, multi-instrumentalist and record producer. He was 66 years old. 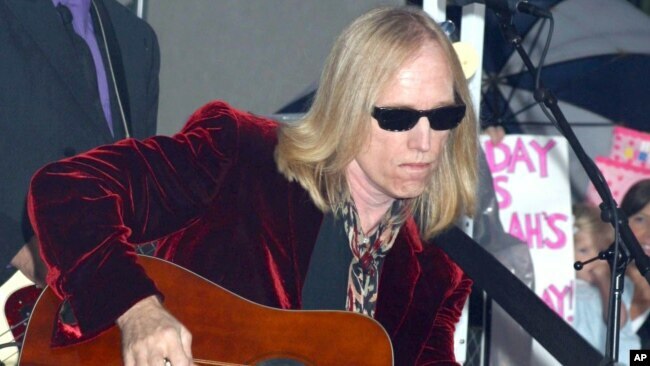 Petty had just concluded his 40th anniversary tour with his band, The Heartbreakers, on Sept. 25 in Los Angeles. Petty was born and raised in Gainesville, Fla.; as he told Terry Gross on WHYY's Fresh Air in 2006, he was from what he called the "redneck, hillbilly" part of town. "It's an interesting place," he remarked, "because you can meet almost any kind of person from many walks of life because of the university. But it's really surrounded by this kind of very rural kind of people that are — you know, they're farmers or, you know, tractor drivers or, you know, just all kinds of — game wardens, you name it, you know. So it's an interesting blend. My family wasn't involved in the college, you know. They were more of just your white trash kind of ... family. And so I have that kind of background, but I always kind of aspired to be something else, and I made a lot of different friends over the years that were — you know, passing through." Wed, Oct 04, 2017 - Tom Petty, an old-fashioned rock star and everyman who drew upon the Byrds, the Beatles and other bands he worshiped as a boy and produced new classics such as Free Fallin’, Refugee and American Girl, has died. He was 66. Petty died on Monday night at UCLA Medical Center in Los Angeles a day after he suffered cardiac arrest at his home in Malibu, California, spokeswoman Carla Sacks said. Petty and his longtime band the Heartbreakers had recently completed a 40th anniversary tour, one he hinted would be their last. 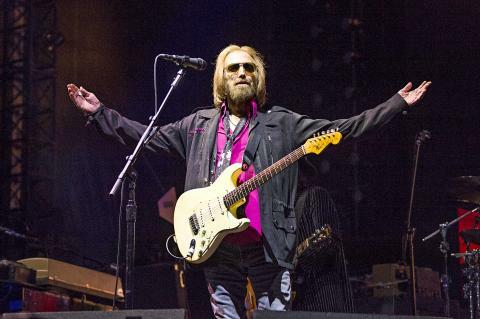 “I’m thinking it may be the last trip around the country,” Petty told Rolling Stone last year. “We’re all on the backside of our 60s. I have a granddaughter now I’d like to see as much as I can. I don’t want to spend my life on the road. This tour will take me away for four months. With a little kid, that’s a lot of time.” Usually backed by the Heartbreakers, Petty broke through in the 1970s and went on to sell more than 80 million records. The Gainesville, Florida, native with the shaggy blond hair and gaunt features was loved for his melodic hard rock, nasally vocals and down-to-earth style. The Rock and Roll Hall of Fame, which inducted Petty and the Heartbreakers in 2002, praised them as “durable, resourceful, hard-working, likeable and unpretentious.” “I’m shocked and saddened by the news of Tom’s passing, he’s such a huge part of our musical history, there’ll never be another like him.” Eric Clapton wrote in a statement. Petty’s albums included Damn the Torpedoes, Hard Promises and Full Moon Fever, although his first No. 1 did not come until 2014 with Hypnotic Eye. Tom Petty performs at KAABOO music festival in San Diego, California, on Sept. 17. Petty died on Monday aged 66. As a songwriter, he focused often on daily struggles and the will to overcome them, most memorably on Refugee, Even the Losers and I Won’t Back Down. “It’s sort of the classic theme of a lot of the work I’ve done,” he told The Associated Press in 1989. “I think faith is very important just to get through life. I think it’s really important that you believe in yourself, first of all. It’s a very hard to thing to come by, but when you get it, it’s invaluable.” Petty did not just sing about not backing down, he lived it. In 1979, he was enraged when his record label was sold and his contract transferred. Stating that he would not be “bought and sold like a piece of meat,” he self-financed what became Damn the Torpedoes and declared bankruptcy rather than allowing his label, MCA, to release it. He eventually reached a new deal with MCA, for better terms. In the early 1980s, he was again at war with MCA, this time over the label’s plans to charge extra money, a dollar higher than the standard US$8.98, for his album Hard Promises. He again prevailed. October 03, 2017 - U.S. rock legend Tom Petty has died after cardiac arrest at his Malibu, California, home. He was 66. Petty's family said he was taken to the hospital early Monday, but he could not be revived. They said he died Monday evening "surrounded by family, his bandmates and friends." Petty was born in Gainesville, Florida, in 1950, and he credits his musical awakening to a chance meeting with Elvis Presley in 1961. The "King of Rock and Roll" was working on a movie nearby and after the two were introduced, a young Petty told his family he was going to be a rock star. But Tom Petty never really saw himself as a rock star, not in the way rock stars are thought of. As a frontman, Petty was no David Lee Roth, or Axl Rose, or Mick Jagger. There was never that larger-than-life swagger and attitude to boot. At times Petty's voice sometimes seemed strained, and quavering, like it was difficult for him to get the notes out. But that didn't matter because Petty was able, with a little help from his friends, to stand behind his music. On the cover of his third album, "Damn the Torpedoes," Petty is standing behind his signature red Rickenbacker, on his second, "You're Gonna Get It," he's barely visible, shadowed in blue light surrounded by the Heartbreakers, the extraordinary musicians who made up his band. Tom Petty was never just Tom Petty, not without Mike Campbell on lead guitar, Benmont Tench on keyboards, Ron Blair on bass, and Stan Lynch on drums, the four who made up the original Heartbreakers. The lineup has changed a bit, but Tench and Campbell remained Petty's constant musical companions. 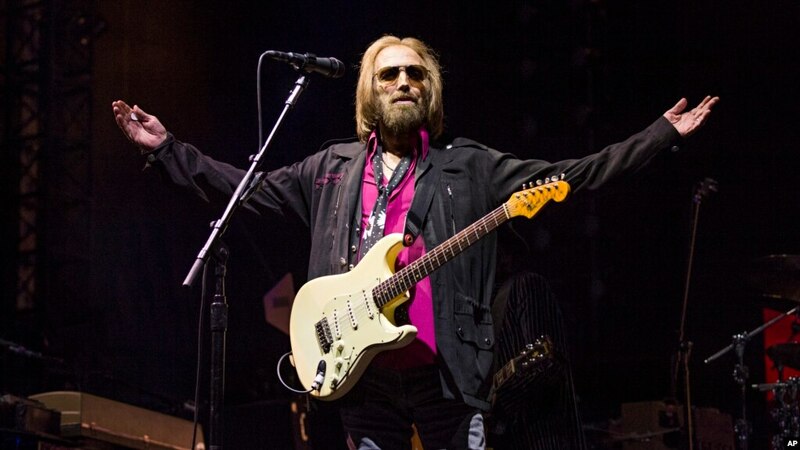 Tom Petty and the Heartbreakers performs at The Hangout Festival on May 18, 2013. It's hard to get a feel for the American iconic songwriter on his first album, eponymously titled Tom Petty and the Heartbreakers. Petty was 26, but on this album, he and his crew are playing around with the band they would become. There are some straight blues numbers ("Hometown Blues" and "Anything That's Rock and Roll"). There's some rhythm and blues and alt-country in there as well. But way down there at the bottom of the record is the song that forecasts the iconic songwriter that Petty was becoming: "American Girl" is the last track on the album about "... an American girl, raised on promises." This is a song of longing, and heartbreak and hope, which is at once evocative, and indicative of where this band was heading. On his third album "Damn the Torpedoes," Petty cements his role as the anti-front man. His songs are about girls, but from the perspective of a a down-on-his-luck guy. The songs show that he needs and adores the women in his life, but is generally terrified and a bit resigned to the pain they will cause him. Tom Petty and the Heartbreakers seen at KAABOO 2017 at the Del Mar Racetrack and Fairgrounds, Sept. 17, 2017, in San Diego, California. "Don't Do Me Like That," for instance, "Even the Losers," and the flawless "Here Comes My Girl," where Petty tells us the tale of the woman "standing right by my side." It's a nearly perfect song — the jangly guitars, the anxious verses, and the soaring triumphant chorus — the sound of a songwriter hitting his stride. All told, the Heartbreakers released 13 different albums, Petty released three solo albums, played with the supergroup The Traveling Wilbury's, and he also reunited with his first band Mudcrutch for some tour dates around the U.S. And somewhere along the way he flew into the stratosphere of American songwriters inhabited by people like Bob Dylan, Bruce Springsteen, Carole King and Stevie Nicks, American musicians who captured day-to-day life, rather than rock and roll excess. On his last studio release, Petty channels the anger of a generation left behind in "American Dream Plan B." "Well, my mama so sad, Daddy’s just mad," he sings, "Cause I ain't gonna have the chance he had..." managing to capture the frustration of the American dream deferred in 17 simple words. 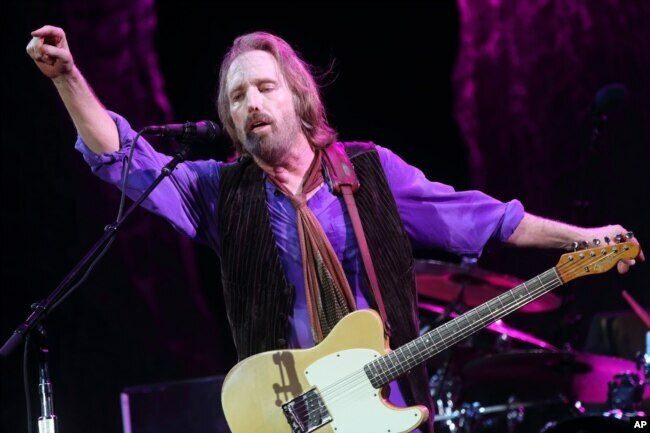 Petty wrapped his most recent tour last week at the Hollywood Bowl in Los Angeles. 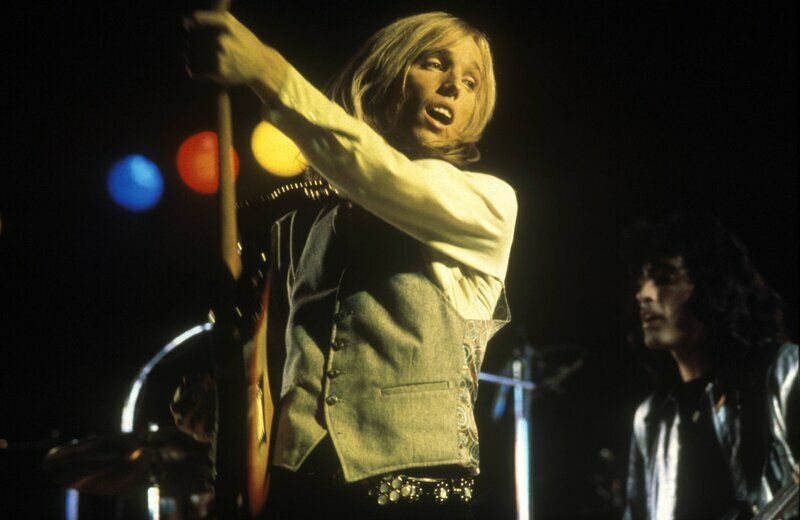 In December, Petty told Rolling Stone magazine that he thought this would be the group's last tour together. He said, "It's very likely we'll keep playing, but will we take on 50 shows in one tour? I don't think so. I'd be lying if I didn't say I was thinking this might be the last big one." Petty leaves behind his wife, Dana York Epperson, a stepson, Dylan, and two daughters, Adria and AnnaKim, from a previous marriage. "It’s shocking, crushing news," Petty's friend and Traveling Wilburys bandmate Bob Dylan told Rolling Stone magazine in a statement. "I thought the world of Tom. He was great performer, full of the light, a friend, and I’ll never forget him." Petty is from Gainesville and the Florida Gators paid tribute to him with a 90,000 peep singalong.